I love trying new things with my mum. I was really scared to crawl in the tunnel but when I saw her I just crawled faster, it was fun! I have learnt the value of repetition and patience. I now realise that in order for a child to learn and develop they need to be shown more than once how to do things. I have learnt ways to encourage my son and I know the importance of praise and encouragement as part of my showing my love for him. It is very satisfying to see a parent (open to both Mum & Dads) come to the Program and start the journey of getting to know their child in a more positive way. Mums who feel weighed down by anxiety and depression and other issues that get in the way of their parenting. 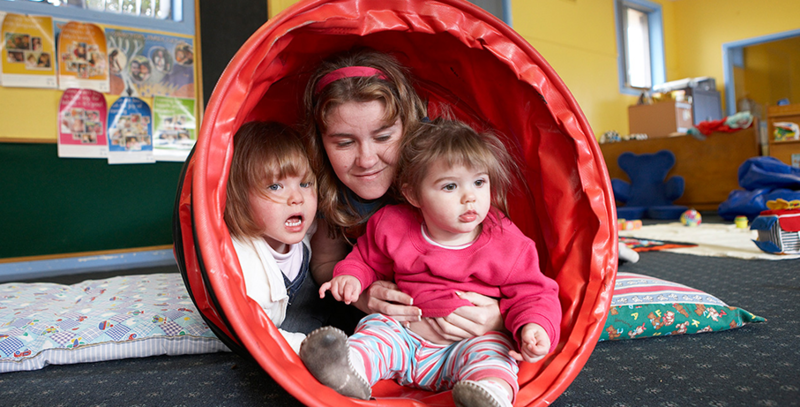 From the tentative start of recognising through play and song the joy of sharing with their child. It also reinforced my belief of the importance of being a parent and having fun. This program builds parenting skills with the emphasis of learning and connecting through play. It is designed to improve parent-child interaction by assisting parents develop a positive relationship with their child. It is a 9-week group program where parents and their children come just for a few hours each week. During that time, parents are shown videos, given handouts and provided with the opportunity for lots of discussion about various aspects of parenting. This includes cues, baby massage, circle of security, getting to know you, path of trust and, at the end of the Program, a celebratory get together with the families in the group. Playsteps gives mothers an opportunity to access group education, one-on-one coaching and advice. It is conducted in a relaxed, informal setting that allows parents to build a network of support with others. Parents learn practical skills whilst they have fun with their children in this program. Playsteps promotes and strengthens the relationship between the parents and their children, helps parents enjoy parenting and strengthen family relationships. In turn, this makes the child more resilient, healthier and improves their developmental outcomes. The first meeting is a one to one information session with QEC staff so that you can decide if you would like to attend the Program. Getting to know you - fun activities to learn about you and your child. Infant Cues - discovering the many ways babies and children communicate. Infant States - looking at how babies and children learn about their feelings and ways parents can respond. Follow my lead - lots of play and letting your baby and child lead the play. Teaching my child - the best way to help babies and children learn. Circle of Security - babies and children during play and ways you can help your child feel emotionally secure. Celebration - we celebrate with all the group the fun we have had and the friends we have made. The path of trust - how children learn to trust and we have some great play activities to encourage the development of trust. Tea, coffee & morning/afternoon tea provided. Bring along the usual things you take out for your child, for example nappies, bottles if used, drinking cup etc. Bring your pram if your child needs a sleep during group. We provide snacks for older children and tea and coffee and biscuits for adults. Some parents feel shy and that’s okay. Our friendly staff will help you feel at ease and you join in when you want to. Is it all group activities? You are in group environment but the staff spend some time with you individually to answer any questions you have and help you with your goals. With your permission, each week staff take photos of your child at play. This is a great way of observing the ways your child communicates. At the end of PlaySteps you keep the book of photos. It is amazing to see the changes in children over 8 weeks.